Starts and finishes: Mtzpe Ramon or Sde Boker. A 4 hour guided jeep tour that explains about the civilization of this region both historic and modern. During the tour we will visit exceptionaly interesting sites that exemplify the civilizations of their period – Hirbet Ma'agora from the early Israelite period, the Hatzatz cisterns from the Nabatean and Byzantine period, the Halukim hill lookout that overlooks the Sde Boker area and the Lipa Gal lookout that overlooks both a modern day farm and Bedouin camps. The itinerary may vary slightly depending on where start and finish. 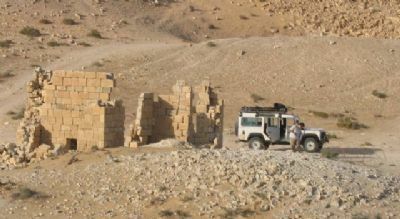 Price: 6 seat Landrover Discovery (up to 6 passengers) 1,200 NIS per jeep or 1,025 NIS for tourists. 8 seat Landrover Defender (up to 8 passengers) 1,450 NIS per jeep or 1,240 NIS for tourists.